My husband is a musician. He recently decided to brush up on his sight-reading, but was having a hard time finding pieces he’d never seen to practice on. 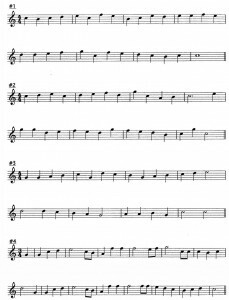 He off-handedly mentioned to me that it would be great if there were a website that would just keep feeding him new, random pieces to sight-read. “If only there was a website that…” The words that launched 1,000 ships! Needless to say, DLE was on the job and only a few months later we launched New Piece, Please! My adolescence is punctuated by important mixtapes. One in particular overshadows all the rest, having defined the scope of my music taste for the better part of a decade. It is the mighty “Keg O’ Tunes”. I have no idea who made this mix. It appeared at some point in my sister’s car during the summer of 1992, presumably having been lifted from the office of the country club she was a lifeguard at. 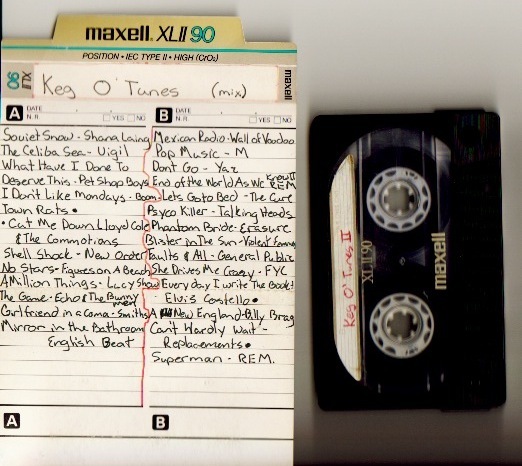 This post is basically a thank-you note to that unknown mixtape author who introduced my 13-year-old self to the Smiths, New Order, Echo & the Bunnymen, the English Beat, General Public, the Cure, and the Replacements. Who would I be now without this mix? There’s just no telling. I recently recreated Keg O’ Tunes as a playlist in iTunes. It was interesting which tracks I already had as MP3s (Girlfriend in a Coma, Mirror in the Bathroom, Superman) and which ones I had a very hard time tracking down (No Stars, A Million Things). It was also interesting how many nuances of the physical artifact were lost. On the mixtape, Psycho Killer begins abruptly and with some weird tone problems presumably left over from whatever tape was serving as the “master” in this case. And the end of the song gets cut off prematurely. The MP3 can’t be made to behave this way. Ultimately the recreation process made me think about how much less precious a mix is when it arrives via ZIP file. Even a mix CD fails (and failed, when it first emerged) to stir me the way a mixtape did and does. It used to take hours to make a good tape — first planning what should be on it, then really considering the order for the songs, queuing up each cassette, trying to make the transitions between songs as non-obnoxious as possible (though now I find the click from hitting stop/record really endearing). My nostalgia doesn’t delude me into thinking there aren’t other things serving the purpose of the mixtape in friendships and romances now, but I don’t think I know what they are. If I was 13 now and had a crush on someone, how would I let them know it? What’s interesting about this, to me, is that the Beatles became less danceable over the course of their career, while Animal Collective have become more so. For more on Alphabetical Shuffle, click the linked tag. Or find out what on Earth is is in my original post about it. The stretch of songs beginning with “How” are an aching, beautiful set, and has me wondering another very human question: Why is “How” so difficult sometimes? It can be even more difficult than “Why”. “Car” is one of my favorite Built To Spill songs and it has a wonderful line in it: “I want to see movies of my dreams.” “car chase terror!” seems like the audio portion of a movie about someone’s dream and thus seems like a fitting response to that line. It adds a little careful-what-you-wish-for element as well, since this particular dream seems more like a nightmare.